What's better than a set of tiny artificially intelligent cars that drive themselves around a track while duking it out with lasers and tractor beams? Well, what if you could configure that track however you want? That's the name of the game with Anki Overdrive, coming this September from the geniuses at robotics startup Anki. 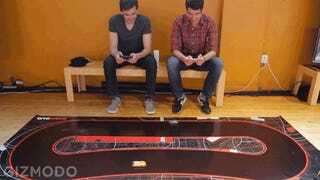 I helped Anki's founders build a track in about a minute flat, just snapping the pieces into place. Oh, and because the track is made of flexible high-impact polystyrene, you can build it right on top of stuff to make a ramp! See the MacBook charger and teleconferencing device beneath this track? 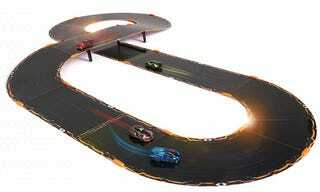 Anki's tiny cars sped across that surface with no issue whatsoever. Because the pieces are modular, that means you can build a whole lot more tracks from the get-go—eight to start—and the more additional pieces you buy, the bigger you can go. But the best part may be that those pieces won't just be curves and straights, but other types of game-changing terrain as well. There's a jump kit that can let up to three cars actually jump off a ramp simultaneously. (Yes, these tiny autonomous cars can jump!) There's a $30 intersection that not only lets a track cross itself, but where cars can choose to turn to stay on the most efficient path. Perhaps the most interesting expansion is the $20 U-turn kit, which comes with two dead end pieces that can be placed on either end of a loooong track, and tells the cars to make a U-turn rather than run off the road! There's plenty more, including a new set of cars, a new user interface for the app, new AI opponents, and a new campaign mode designed to give the game a story and objectives of some sort, but the modular track is definitely the star of the show. The idea of not being confined to a single track makes this feel like a high-tech toy I could actually consider buying. Shame there are so many months between September and now.